Can I Really Succeed at This? The answers to the "frequently asked questions" below can help you decide if you should join our Watkins team. What's this business all about, and why would they need someone like me to work from home? 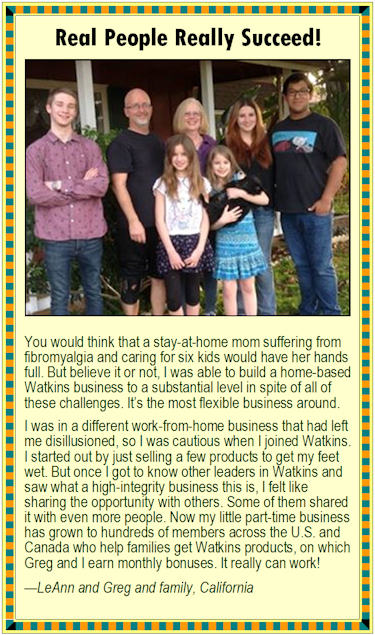 Watkins will reward you with immediate profits and monthly bonuses if you help get more families using Watkins products instead of other brands. You can do that by selling products yourself and/or by helping bring other members to the business. And, of course, you can get a nice discount on any Watkins products you want for yourself. The reason Watkins wants you and other normal everyday people to work from home is because social marketing (hearing about something good from another normal person via phone, Facebook, email, or face-to-face) has become more effective than typical ad campaigns. So, instead of spending millions on expensive advertising, Watkins lets normal everyday people earn income and bonuses for helping spread the word about their products and the business. In other words, just by your willingness to try Watkins products yourself and to tell other people about Watkins, you've got more power than a big advertising firm—and Watkins will reward you for it. Pretty cool, huh? I've never had my own business before. What help is available to help me succeed with Watkins? Don't worry, there will be lots of free help available to you. Everyone who joins Watkins is "sponsored" by someone. It may be a person you know, or someone you just met online. Your sponsor will likely be the person who sent you to this website. They'll be available to answer your basic questions and offer friendly encouragement as you get started. But don't worry if your sponsor is relatively new just like you, or has goals in the business that are more modest than yours. The good news is that all Watkins members get free access to a private, password protected website called TimelessIntegrity.com. This site offers tons of exclusive free coaching, online training, webinbars, business tools, recognition, and encouragement—all provided free by your leaders in Watkins. Free access to our training site, where you can read our Quick Start Guide and other great articles that teach you how to make the most money in the least amount of time. Free business tools you can print from our training site, including price lists, business cards, and a brochure with the same information as this website that you can share with other people. Free recruiting website (like this one, but personalized with your name), where you can send other people who may be interested in joining Watkins under you. Free order-taking website where your friends, relatives, neighbors, and other potential customers can shop. Free audio/video training including detailed explanations from successful members, periodic audio discussions, and archives of past training discussions. Free individual coaching via e-mail or phone as needed with top leaders in our business. Free back office area where you can monitor your team's activity for the current and past months. This business is quite simple. You can retail products to customers to earn immediate profits (through methods including catalog sales, party sales, and booth sales). Or, help other people get started as members (by sending them to your free website just like this one, or by giving them copies of our printed brochure), and you can earn ongoing bonuses as they build their business. Plus, you get the member's discount on your own purchases, saving your family money. It's easy! Why is this better than other ways to earn income? This business gives you the ability to earn income while still having complete time flexibility for your family, your full-time career, hobbies, clubs, church, or other things that are important to you. You can begin earning income immediately by retailing products. By introducing others to our business, you can also build a large, ongoing income which continues month after month, even when you're taking time off. You can get the income tax advantages of being a small business owner, which may let you get larger income tax refunds. You won't have any "boss" or any leaders breathing down your neck. You do as much or as little as you want, and you can adjust your level of involvement at any point without needing to explain your decisions to anyone—it's totally flexible. All those reasons make this a perfect way to earn income. How much can I earn by selling? 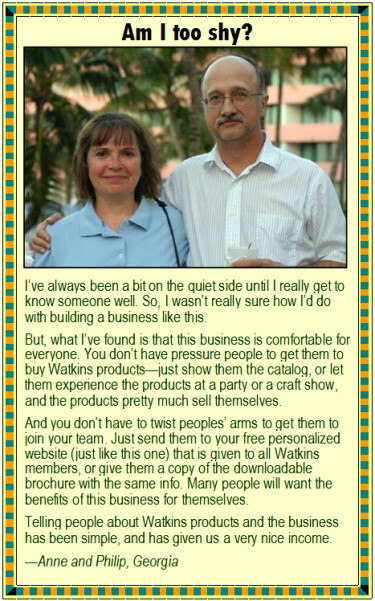 People just like you have been making a living selling Watkins products for decades. There are many potential customers just waiting for someone to offer them the full line of Watkins products. Some people sell a little to make some extra spending money. Others work their business seriously and sell thousands of dollars in products each month, earning a full-time income. How much can I earn by sponsoring? Just like the funny video that goes "viral" on Facebook, sharing the Watkins business with others can grow just as quickly. Many people focus on team building, because they feel it is the fastest way to generate the amount of sales necessary to reach their income goals. Over time, the income earned through building a team can be substantial, offering true walk-away residual income. How much time will it take? Are there monthly minimums or requirements? Put in as much or as little effort as makes sense for you at any point. There are no monthly requirements (and you won't be "kicked out" if you do nothing at all), but discounts start with monthly sales of $150, and more bonuses kick in and get larger as you reach certain thresholds. So, like everything in life, you can get bigger results by taking more action. The only required fee is $29.95 to activate your account with Watkins, for which you get your first year of membership, the member discount, and access to an online informational packet with training and basic instructions from Watkins. (Renewal in subsequent years is $29.95.) You also get free access to all of the training and tools provided on the TimelessIntegrity.com website. Depending on how you want to build your business, you may want to get catalogs or other optional business tools from Watkins, which are reasonably priced. And, naturally, you'll want to order Watkins products for your own use, but (with your discount) it can be the same or less than you're already paying at other stores for similar products—so that won't add any new expense to your budget. All in all, there's no other business of this caliber with such a low start-up investment. Is there a need in my area? We're not aware of any area of the U.S. or Canada that has "too many" Watkins members. But as a rule of thumb, ask yourself how many different Watkins members have offered you a catalog in the past year. If it's less than five, then there's definitely a need for you to sell Watkins products in your area. As far as sponsoring, the number of members in your area doesn't matter, because you can reach out to anyone living anywhere in the U.S. or Canada. Just contact Watkins during your first thirty days and they'll get you a refund.